Most thought leadership tries to teach customers something they don’t already know or believe about their business—often grounded in future trends or technology shifts. It’s about their future business. What their business could be. But thought leadership rarely changes the customer’s direction in the buying process. And that means the same old purchase criteria and the same old price-driven competition. 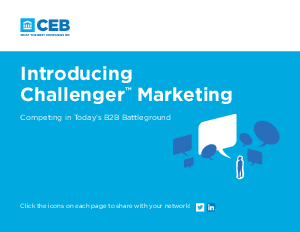 The Challenger Marketing approach instead “unteaches” customers something they are already doing in their business. Only this kind of mental disruption—or challenge—can reliably reset the customer’s purchase criteria decisively in your favour.